KEY WEST, FLORIDA (WBTV) - Rick Hendrick and his wife Linda were among four people onboard a plane when it crash-landed at the Key West International Airport. The aircraft, a Gulfstream 150, was registered the Jimmie Johnson, however he was not on the plane at the time. The crash happened at 7:45 p.m., said Monroe County Sheriff's St. Evan Calhoun. Calhoun said the pilots radioed into the control tower saying they lost brakes upon landing. The Hendricks and both pilots onboard were taken to the Lower Key hospital, but officials said there were only minor injuries. According to a statement from Hendrick Motorsports on Tuesday morning, Rick Hendrick suffered a broken rib and a broken clavicle in the crash. His wife, Linda, was treated for minor cuts and bruises. Both pilots were evaluated and released without injury. All four have safely returned to North Carolina. The plane ran completely off the runway and the runaway was closed for a short time before being reopened. The plane appeared to suffer some damage with the left wing dipped down into a puddle of water and the nose of the plane into the ground near a fence. The Key West incident happened on nearly the same day as a major plane crash involving the Hendrick family 7 years ago. That crash, on Oct. 24, 2004, killed all 10 aboard, including his son, brother and two nieces. The crash happened after the plane took off from Concord and was on approach in fog at a Martinsville airport. The National Transportation Safety Board was notified and will be investigating the incident. 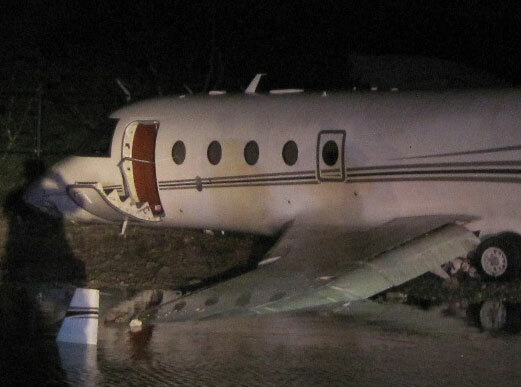 The plane remains in Key West. Rick Hendrick owns a waterfront home on Sunset Key just east of Key West, The Miami Herald reported.